While there are many things you need to consider when building a new Melbourne carport, you probably wouldn’t think that bushfire was one of them. Particularly when you live only 24 kilometres from the heart of the city and only a short distance from the famous Yarra River. Yet fire was one of the big considerations of a family who live in Warrandyte, in the north east suburbs of Melbourne. The family’s land adjoined a State Park and they wanted to build a new Melbourne carport that would not only withstand a potential bushfire, but also help the owners survive it. Their idea was for a large 3-car carport that included a large storage shed and fire shelter, and they were faced with stringent building regulations in order to achieve it. 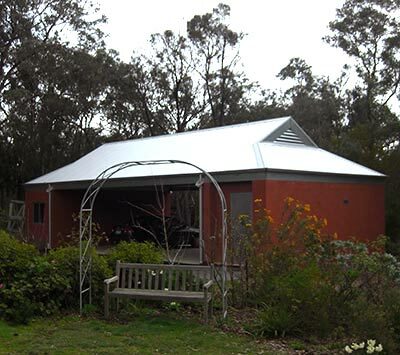 The end result, which was completed several years ago by Mr Carports Melbourne, was a structure that not only met the building regulations, it in some cases exceeded them. For materials, brick, steel framing and zincalume corrugated roofing were chosen. All perfect for fire-prone areas. But the real ingenuity was the way the materials were put together, to ensure there were no issues with wind uplift. The eight brick piers were steel reinforced to the foundations and concrete filled. The reinforced rods were then bolted to the roof frame to complete an incredibly strong anchor. While the practically and ability to withstand bushfire are impressive, what shouldn’t be lost with the Melbourne carport is that it’s also a terrific looking structure. The zincalume corrugated roofing matches the nearby house and the large Dutch gable roof would look impressive anywhere. As well as designing and building the Melbourne carport, using our knowledge of local planning and bushfire requirements, we also organised the required building and planning permits for the owners. We even took care of the Builders Warranty Insurance. Whether you want a Melbourne carport to withstand fire or simply the urban elements, Mr Carports are the best team to call. Phone us on 1800 557 782 or view our Melbourne carports page for further information and ideas.